Beans and Cornbread: Feeding Souls a Mile Deep Simmered all day with a slug of fatback, brown beans have warmed many hardworking West Virginia miners. Kendra Bailey Morris shares memories of pintos and cornbread and her great-granny Charity. Cornbread and pinto beans, onions, cole slaw and chow chow relish make up a hearty — and heartwarming — meal rooted in the rolling hills of West Virginia and its coal mines. Get recipes for pinto beans, cornbread and chow chow relish. A bowl of smoky pinto beans is to West Virginia what an earthy Cabernet is to the Napa Valley: It's an indulgence relished by locals, intriguing to outsiders and central to the region's culinary landscape. 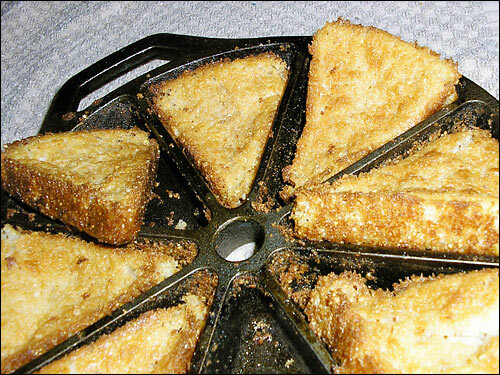 For a true West Virginian, nothing compares to sitting down to a steaming bowl of brown beans served up with a crumbly wedge of homemade cornbread (or grit bread, as we like to call it). Simmered all day in a cast-iron pot with a big slug of fatback, brown beans have warmed the bodies and souls of many hardworking men and women of the Appalachian coalfields. My mother grew up in Anawalt, W.Va., a small coal-mining town hidden deep in the state's southwestern hills and valleys. Anawalt is one of many nondescript towns that lived and died by the fortunes of King Coal. Today, it's a ghost town where the whispers of miners who carried day-old biscuits in their lunch pails as they descended a mile deep mingle with the few inhabitants left, whose per-household incomes hover around the $14,000 mark. It was here that my mother learned the simple culinary art of making the beans and cornbread meal from her grandmother Charity, who ran a small boardinghouse that welcomed miners hoping to find work inside the damp hollows of the nearby mountains. Miners, their faces still streaked with coal dust, gathered for supper in Charity's cozy kitchen along with the family. My great-grandmother stood at the wood stove, periodically wiping her hands on a stained, floral-patterned apron. Pinto beans simply seasoned with a chunk of fatback and a little salt and pepper bubbled inside a large cast-iron pot. As the miners sipped mugs of hot coffee, my mother laid out bowls of chow chow relish, minced onions and cole slaw to accompany the beans. Out of the oven came the cornbread in its own cast-iron pan, still sizzling with the essence of bacon drippings. It was 1943, only a few years after one of the Pond Creek mines in Bartley, W.Va., exploded, claiming the lives of 91 men. It was a time when phrases like "scrip," "black lung" and "mining disaster" fell from the lips of workers, wives and children like the tar-colored dust that settled on their windowsills. It was a time when the grand comforts of coal company officials contrasted sharply with a miner's family struggle amid the crushing poverty of the coal camp-- where food and provisions had to be purchased at the company store, owned by the coal company itself. The beans and cornbread meal was born of these ironies and inequalities. Loaded with protein, carbohydrates and fiber, it was a healthy, satisfying reprieve from the 12-hour days a miner spent on his knees in a dark and unforgiving coal shaft. And, it was inexpensive. 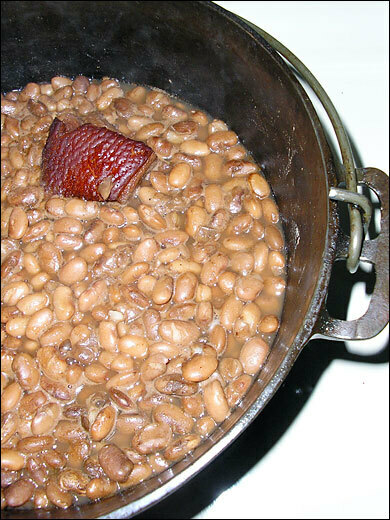 Made from ingredients that were often on hand and relatively nonperishable (such as cornmeal, bacon grease, dried beans, grits and fatback), the beans and cornbread supper was easy to prepare and could keep for several days. Even better, while the beans simmered in a pot for most of the afternoon, a hard-working woman like my great-granny could get back to washing clothes, canning, gardening and looking after the children. Today, you can still get a taste of real beans and cornbread throughout West Virginia, whether you are curled up in small corner booth at the local diner or are one of 300 guests attending the annual Mercer County Democrats "bean dinner" honoring the likes of U.S. Senators Robert C. Byrd and Jay Rockefeller. 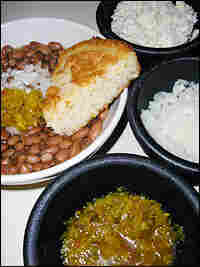 Cornbread and beans are the type of food, simple and warm, that reminds us all of where we come from. And for West Virginians, they represent the true soul of the mountains. Read last week's Kitchen Window: Purim cookies and candies. 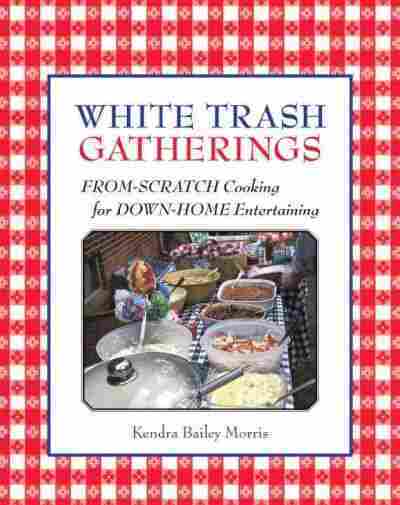 Recipes below excerpted from White Trash Gatherings: From-Scratch Cooking for Down-Home Entertaining by Kendra Bailey Morris (Ten Speed Press, 2006). 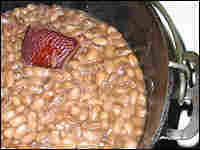 Put beans and water in a cast-iron cooking pot on medium heat. Next, put fatback in a microwavable coffee cup and cover with water. Microwave on high for 30 seconds or so, then turn the fat over and do the same for another 30 seconds. Pour the fatback and broth into the cooking beans. Once the beans begin to lightly boil at medium heat, lower the temperature to low, cover and cook for about 2 hours. Every half hour or so, uncover beans and give them a stir, making sure they are simmering in enough cooking liquid. If beans appear dry, add a little more water. Once beans are tender, season with a little salt and plenty of freshly ground black pepper before serving. Grit bread is similar to cornbread, but it's made with pure stone-ground grits, giving it a texture unlike any you've ever tasted. This bread is dense, moist and not at all sweet on the inside while golden and crusty on the outside. You can find stone-ground cornmeal in specialty and organic grocery stores. Chop up vegetables into a medium dice. Sprinkle with pickling salt; cover and refrigerate overnight. Lightly rinse veggies and drain well. Put the remaining ingredients in a large pot, and bring to a boil. Add the vegetable mixture and cook for about 10 minutes. Pack into sterilized canning jars, leaving about 1/2-inch headspace. Remove any air bubbles. Wipe jar rims and seal at once according to canning manufacturer's directions. If you don't have any canning materials handy, you can store relish in an airtight glass container in the refrigerator for up to a month.